You are here: Home » MEDIA » Books » The Boost by Stephen Baker (book review). 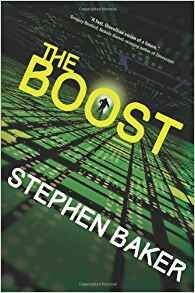 The Boost by Stephen Baker (book review). ‘The Boost’, title and product of Stephen Baker’s book, is a neural link embedded in people’s skulls, allowing them to interface with a futuristic Internet and request information and share photos. Although written in 2014, not much different to what some of you have on your smartphones today. However, the upcoming latest world-wide upgrade due from China will also allows government agencies and corporations to keep tabs on where you are. There’s some rebellion from some people and these flee to the US/Mexican border to stay out of the way and even have their boost surgically removed. It’s easier to learn this basic principle from the book sleeve than reading this book which tends to focus more on the individuals waiting around as Baker describes their eating habits and general talking. Key characters, include Suzy Claiborne and Ralf Alvare, who appears to be the only rogue software specialist capable of stopping this, is waiting for his brother, Simon. This draws its own problems. Those of you who are aware of computer programming know that existing software is built upon with new routines and this is often where glitches arise when commands are in conflict with each other. We’ve seen enough banking crisis to see that happen. Having Alvare capable of doing this preventive action on his own is really stretching things. There are references to the more primitive Google and Microsoft and Bill Gates but this appears more for the sake of the reader than the characters involved. There’s also a general lack of urgency or threat from the changes that are about to happen, so the real implications don’t sink in. With stories, you really need to be in the heart of the action but all of this is on the sidelines. Even when Alvare does do the program alteration, it almost feels like a side-note in the whole proceedings than the whole point of the story. He doesn’t even come over as being a genius. Although I don’t expect any SF writer to get too technical, it misses a complete heartbeat on the entire thing. It was only when I was a third of the way through the book that it became very apparent that Baker was reporting events and there was a lack of emotional content. The blame for me picking up on that could be the bland Mexican border and waiting for something to happen and hadn’t let it sink in. Baker’s previous books have been in non-fiction and I don’t think he’s made a successful transition yet. ‘The Boost’ had an interesting premise, even though I doubt if everyone would be happy to have an implant when things like smartphones would have to have been around. In fact, I’d be surprised if more than 10% of the world population would have it. Even more so when your boost implant can be taken out and implanted in someone else for them to get access to your personal thoughts and diary. In many respects, Baker only skimmed the surface of his own idea than all the implications. « Your Place In The Universe by Paul M. Sutter (book review).